You can use feng shui bamboo flutes as a cure or remedy for afflicted areas. The east, southeast, and south sectors are ideal areas to use bamboo flutes since in feng shui applications these sectors are ruled by the wood element. Bamboo flutes become more than a feng shui remedy when they are a natural part of your home decor. Bamboo is a sturdy and strong plant. It also represents peace. Bamboo has been used for centuries as a building product in China and other regions where it is abundant. 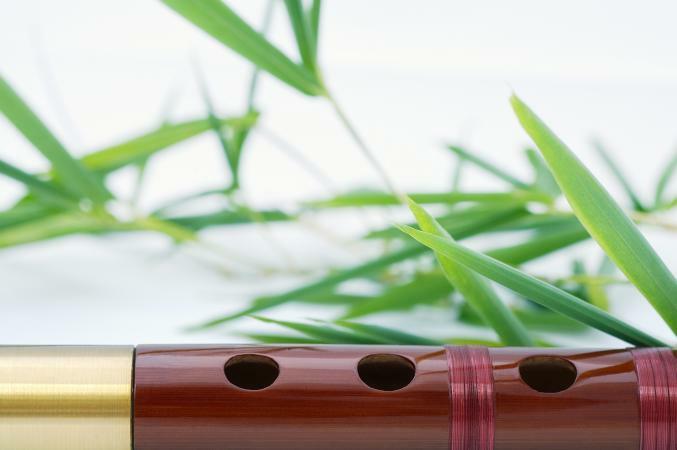 The bamboo flute offers a physical demonstration of how the unseen chi energy (breath/air) moves and flows. The breath (chi) moves through the instrument to generate various sounds by the opening and closing of finger holes and through breath control techniques. As a physical symbol of chi, the flute became a natural and powerful tool in feng shui applications for redirecting the flow of chi energy. Using flutes as a remedy for inauspicious exposed ceiling beams has been popularized by the Black Hat sect of feng shui although many classical feng shui experts embrace this practice. Overhead exposed beams are believed to cause illness to those sitting, working or sleeping beneath them. In addition, it's believed that beams in a bedroom can divide a couple, ending their marriage. Some feng shui practitioners only consider supportive beams as ones in need of a remedy while decorative beams are given a pass. A good rule of thumb is to consider should the beam fall would the ceiling fall as well. If not, then the beam is for decorative and not structural purposes. While some classical feng shui practitioners don't agree with the flute application to overhead beams, many do. The best way to determine if this is a successful remedy for your home is to try it and see. Feng shui experts like world-renowned guru, Lillian Too, advises to use bamboo flutes as a remedy for overhead exposed beams. Too recommends hanging a pair of bamboo flutes with the open ends pointed up and mouthpieces down. Place the flutes in an "A" shape along the edge of the beam. The philosophy for this kind of flute placement is that the negative chi energy is forced back up to the ceiling. 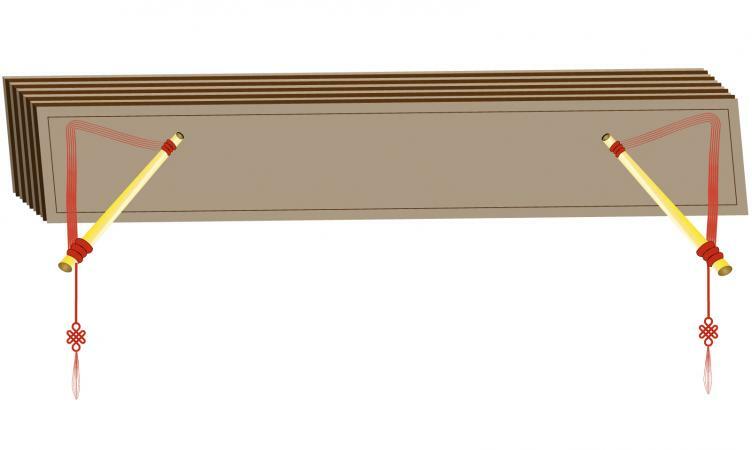 Most bamboo flutes are sold with a red cord for hanging on the wall or in this case, a ceiling beam. Another popular way to use bamboo flutes on a beam is to hang one on each end of the beam facing each other. Hang the flutes at a 45 degree angle, ends up. This angle represents the top part of the bagua shape, which is auspicious. If you have a patio, deck, gazebo or porch area with supportive overhead beams, you can always use this remedy there as well. There are many ways to use bamboo flutes for feng shui remedies other than cures for beams and ceiling irregularities. You can use a bamboo flute in any sector that needs activating. The rule of thumb is to mimic the bagua side (angle) for the sector you wish to influence. South (fame and recognition): Hang the flute horizontally. West (descendents): Hang the flute vertically. Northwest (mentor): Place the flute at a 45 degree angle pointing up toward the right. North (career): Hang a flute horizontally. Northeast (education): The flute should be set at a 45 degree angle pointing up toward the left. East (health): Hang the flute vertically. Southeast (wealth): Place the flute at a 45 degree angle pointing up toward the right. Bamboo flutes have long been used as a symbol of protection. Hang a bamboo flute horizontally directly above the front door (inside) to ward off enemies, burglars and spirits wishing to do harm. To ensure only auspicious chi enters your home, hang a flute inside horizontally above the door leading from the garage into your house. There are several business use for bamboo flutes. Retail: Hang a flute near the cash register. Capitalize on the auspicious effect by placing the flute on the southeast wall. 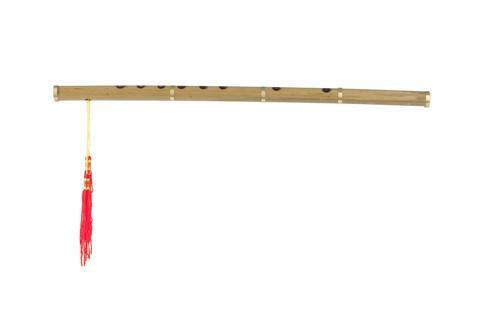 Office: Hang a bamboo flute on the southeast wall of an office or home office to attract wealth. Bamboo flutes can be used to redirect the oppressive energy a slanted or uneven ceiling can create. The flutes should again be angled at 45 degrees. Place one on each end of the wall, directly beneath where the ceiling joins the wall. Point the end up towards the ceiling. This placement ensures that the inauspicious chi energy returns to the ceiling. The good news about shopping for bamboo flutes is that the feng shui flutes are real flutes that you can play. A real bamboo flute will have several joints and larger flutes often have what's known as the root part of the bamboo that's believed to be very auspicious. Most Chinese flutes come decorated with a mystic knot tassel tie at the end of the flute; some may have a tassel on each end. Walmart offers a pair of feng shui bamboo flutes in a natural finish. These 17" long flutes are banded in red and feature a coin tied to a mystic knot and tassel. Price: Around $22 plus free shipping. 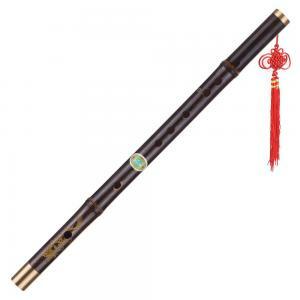 Unique Feng Shui offers an 11" long medium natural blonde flute. A red cord is provided for hanging the flute as well as a mystic knot tassel on one end. Price: Around $6.50 per flute, shipping cost calculated at time of checkout. Ali Express features a handmade Chinese traditional bamboo flute in D Major. A poem is carved into the flute in Chinese characters and a mystic knot tassel. It's 22.43" long with a .94" diameter. Price: Around $6 plus $2 shipping fee. Amazon features a pair of 16" long bamboo flutes with a red hanging cord. Price: Around $12 plus $5 shipping fee. A few of the compass sectors within the bagua might be potential candidates for a bamboo flute remedy. These sectors include those governed by the wood element or are the recipient of auspicious wood element in the productive cycle. These include, east (wood), southeast (wood) and south (fire). You can add a bamboo flute to any of these three sectors when you need to activate the chi energy.